Fifteen-year-olds in Northern Ireland are being outperformed in international tests in maths, reading and science. While their performance in the Pisa tests run by the OECD think tank has shown little change, other countries have improved. The biggest problem is in maths, and the Department of Education said these challenges needed to be faced. It said that while improvements to the curriculum had been introduced, this was too soon to have had a impact. The Pisa tests - the Programme for International Student Assessment - have become the most influential rankings in international education, based on tests taken by more than 500,000 secondary school pupils. 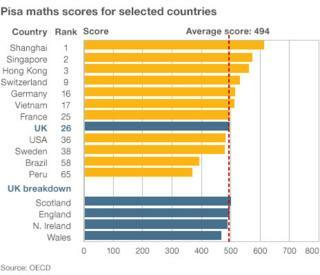 As a whole, the UK has made little progress and remains among the average, middle-ranking countries, in 26th place for maths and 23rd for reading, broadly similar to three years ago. But the biggest gap is between Wales and the other parts of the UK, adrift from most of the middle-ranking western countries. The Republic of Ireland has improved in the three years since the last survey, and now greatly outperforms Northern Ireland in maths, reading and science. Northern Ireland Education Minister John O'Dowd said the survey was "a useful indicator of the state of our education system", containing "many positives". Sixty five countries were involved in the Pisa study, and the results suggest Northern Ireland is lagging behind even poorer areas of the world. Northern Ireland has traditionally claimed a very good performance at the highest academic level and poor performance at the bottom, but despite that perception, the Pisa study of mathematics shows that we have a smaller proportion of high achievers than the Republic of Ireland and other regions of the UK apart from Wales. On the positive side, children in Northern Ireland have a better attitude to education than most other countries in the survey, with truancy and classroom disruption below average. However, the proportion of school principals who say students lack respect for teachers has risen sharply from 7% to 19%. "However, the report also confirms what we already knew - that our education system at post-primary level has much room for improvement," he said. "Indeed, I have been on record as saying that we need to address the challenges in post-primary education and I believe we can and must make the necessary improvements to ensure all children can fulfil their potential. "The Pisa report shows that too many 15-year-olds are performing at the lowest levels in these key subject areas. "It also delivers a clear challenge to those who claim our education system delivers academic excellence. In maths, for example, only 10.3% of our 15 year olds are performing at the highest level. This lags behind the OECD average and well below the attainment level in some countries." Socio-economic background has a larger effect on pupil attainment in Northern Ireland than on average across the OECD countries. As with all countries, girls significantly outperformed boys in reading. There was no statistically significant difference between boys and girls, in comparison to the OECD average, which shows a statistically significant gender difference in favour of boys by one score point. What are these Pisa tests?